Driving across Colorado is an amazing accomplishment and a trying task, all at the same time. 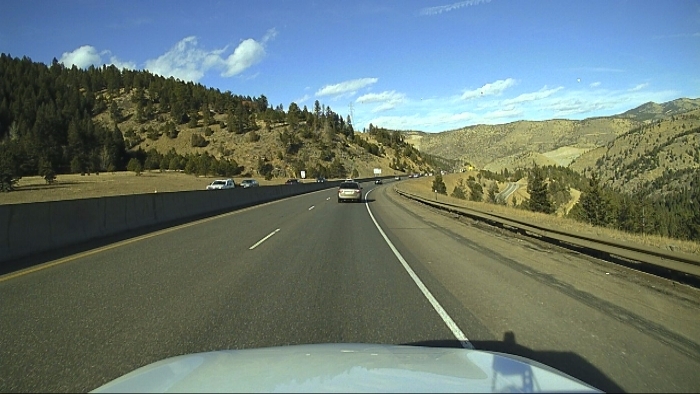 Interstate 70 makes the job of crossing the Rocky Mountains relatively easy, but it can still be a white-knuckle experience that combines with the lightheadedness from high altitudes. Making the drive in winter is an even bigger gamble — transportation officials do their best to keep the road open, but a snowstorm can shut things down quickly. When I went to Colorado in January 2018, my ultimate destination was Utah, which meant I needed to take the quickest path across the state. Fortunately, I was just one day ahead of a winter storm, which meant the conditions were pretty good. I really wanted to be in Arches National Park for the snowfall, so I didn’t spend a lot of time along I-70, but I can show you a few highlights, including the charming town of Georgetown. Interstate 70 is the primary east-west route across Colorado. From Denver, hop onto Interstate 70 and head west. Georgetown is about 45 miles from Denver, Grand Junction is 240 miles, and Moab, Utah is 350 miles. Traffic on Interstate 70 can wear you out, quickly. Once you hit the foothills, you’ll only have two lanes in either direction, and there will be a lot of other drivers on the road navigating those curves with you. And once you get up to around 8,000 feet, you might start feeling the effects of the high altitude — lightheadedness, tiredness, nausea, and headache. At least, I was. And it was about this time that I came upon Georgetown, and decided it was a great place to stop. I had driven through Georgetown a few times before, and each time I thought it looked like a place that deserved my attention. But, each time, I was on my way somewhere else, and didn’t have the time. That was also the case on this day, but I decided to explore a little, anyhow. The road to Guanella Pass begins at Georgetown. The road gains more than 3,000 feet to the pass at 11,669 feet above sea level. You can check out my visit to Guanella Pass here. 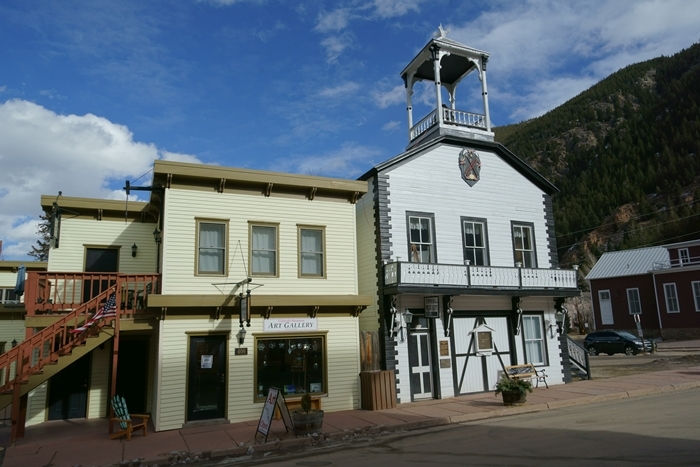 Georgetown boomed in the second half of the 1800’s, and at one point the locals even lobbied for the state capitol to be moved there from Denver. The silver boom collapsed in 1893, and Georgetown struggled for a few decades until people rediscovered its charm. Georgetown has some historic storefronts lined up along 6th Street. Find a parking spot and wander around for a few minutes. Georgetown’s town hall also caught my eye. 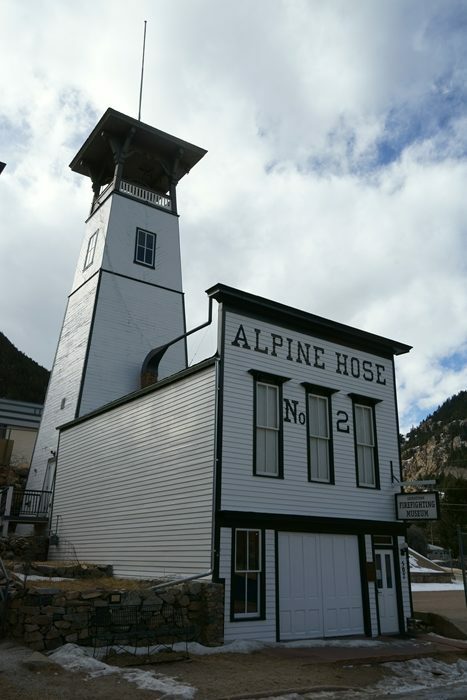 This distinctive building is home to the Alpine Hose #2 Firefighter Museum. It’s open every day except Monday from 10-4, and admission is $5 (as of 2018). Up in that tower, a 1,200 pound bell still rings twice an hour. 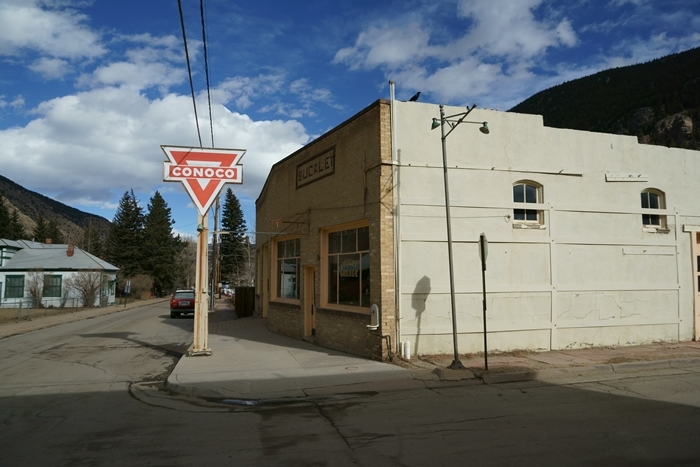 I love old signs, and this one for an old Conoco station has obviously been around for a while. Keep climbing on Interstate 70 from Georgetown, and you’ll reach the highest vehicular tunnels in the United States, and at one time, the world. 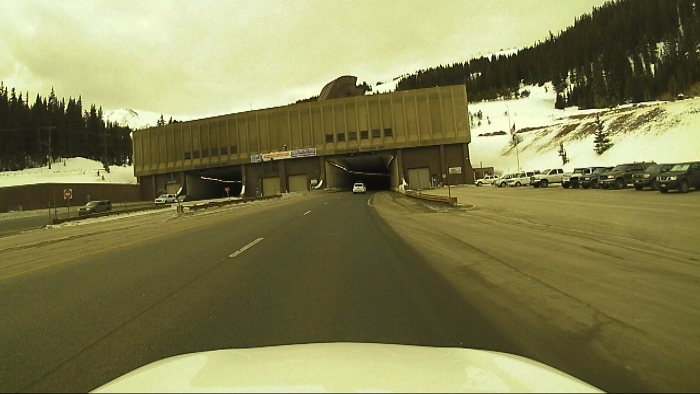 The Eisenhower Tunnel enters the mountain on the east side at 11,158 feet above sea level (it’s slightly lower at the western end). This shot is from my Drivelapse camera, which explains why it’s a little odd. 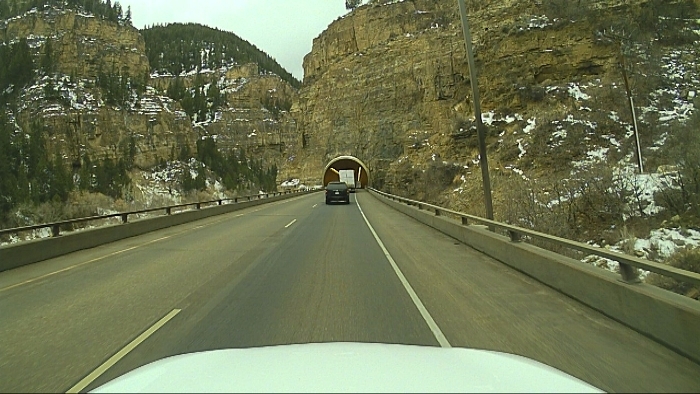 You can see the drive through the tunnel, and the entire drive from Denver to Utah on Interstate 70, in the Drivelapse video down the page. If you’d rather go over the Continental Divide, instead of under it, US 6 provides an alternate route. 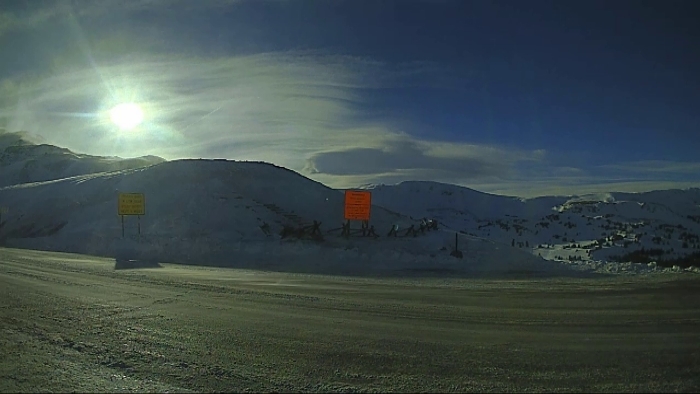 Loveland Pass tops out at 11,990 feet. 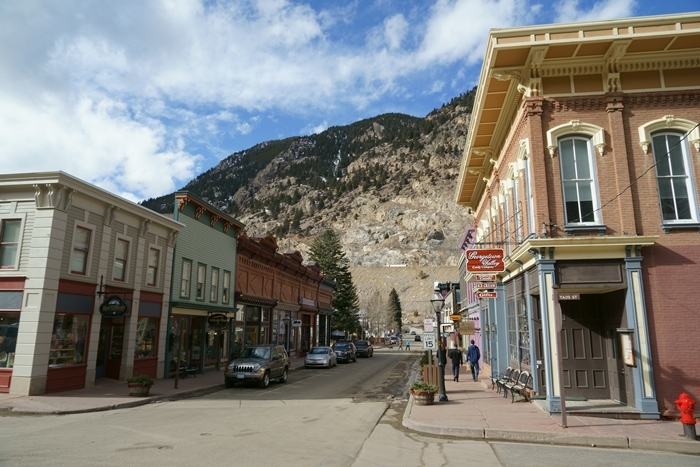 Driving Route 6 will add some time to your trip, because the road is curvy, and on the west side you’ll need to pass through Keystone and Dillon before rejoining I-70. However, it’s a fun drive. And if you’re staying in the area during the summer months, you can hike some trails at the pass, like Mount Sniktau. I drove over Loveland Pass on my return trip. 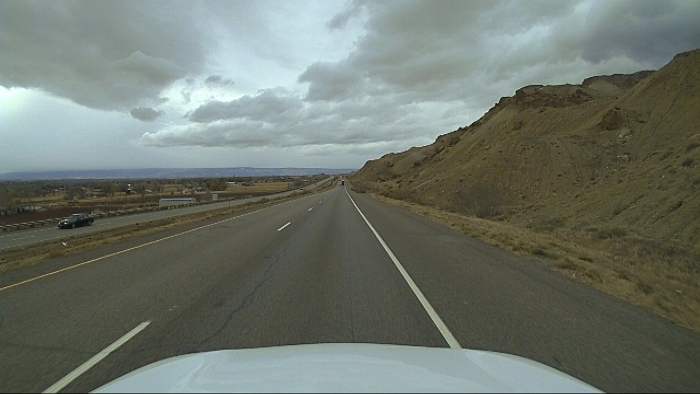 As you can see from this Drivelapse camera shot, there’s plenty of snow on the surrounding mountains, but the road itself is clear. Road crews keep this pass open as much as possible because it provides access to several ski areas. The Colorado River squeezes through a tight canyon with walls reaching 1,300 feet, on the east side of Glenwood Springs, Colorado. Glenwood Canyon provided a major challenge for road builders, and as you pass through, you’ll see why it became one of the most expensive stretches of highway in America. The final link of Interstate 70 in Colorado stretched for 12 miles, and cost almost a half billion dollars. Construction began in 1980 and wasn’t complete until 1992. Road crews built three tunnels and 15 miles of retaining walls. 1.62 billion pounds of concrete went into its construction. In some places, one direction of Interstate 70 is almost directly above the other, as viaducts take the traffic through narrow spaces. Watch the Drivelapse video below, and you’ll see that it truly is a wonder of engineering. If you have time to hike a trail as you drive through Glenwood Canyon, be sure to check out Hanging Lake. It will be crowded with visitors in the summer months, but it’s truly magical in the winter when the waterfall is partially frozen. … towards Grand Junction. 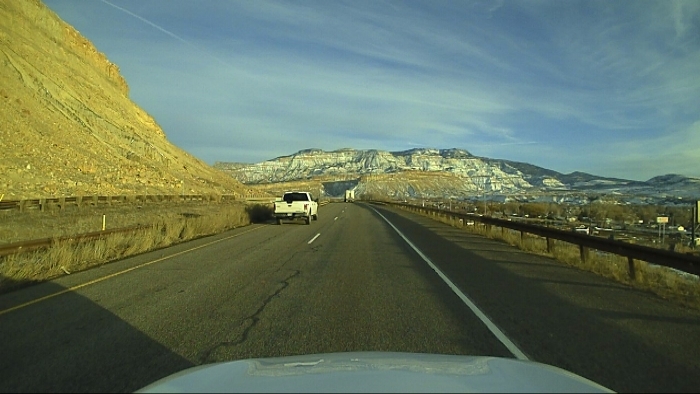 This is a look at Interstate 70 headed eastbound near Grand Junction, on my return trip, around sunset. When in Grand Junction, consider diverting off the Interstate for a drive through Colorado National Monument. A scenic drive through the mountains above the city takes you to numerous excellent viewpoints. Once you’re through GJ, all signs of civilization vanish. You’ll need to turn onto Cisco Road (paved but poorly maintained), or drive on to the next exit to take Utah Highway 128. Either way, you’ll end up on U-128 for the scenic drive into Moab. Alternatively, you could continue on to US 191, but you’ll be missing the beautiful Fisher Towers and Castle Valley area. There’s far more to see along Interstate 70 in Colorado than I can tell you about on one page. If you need to get across the state, allow plenty of time, beware of altitude sickness, and enjoy the scenery along the way. 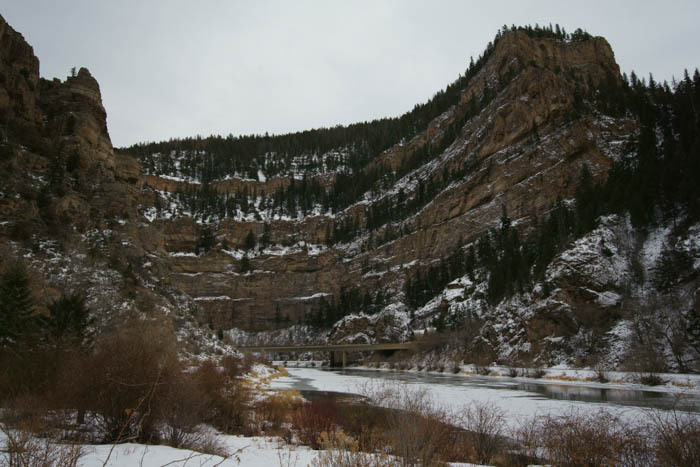 If you have more time, stopping in Glenwood Canyon or Georgetown is a great idea.